With portable database licenses, Teradata customers now have the flexibility to choose, shift, expand, and restructure their hybrid cloud environment by moving licenses between deployment options as their business needs change. This new software licensing model is the first in the hybrid cloud market to feature portability — a shift away from cloud lock-in or siloed on-premises deployments. Until now, hybrid cloud vendors have offered complex, inconsistent licensing models across deployment options that make it difficult for customers to select a solution that fits all needs. Teradata is changing the game with licensing flexibility and portability to ensure simplicity and consistency in support of agile, fast-growing businesses. “The Teradata Database continues to be recognized as the leading data management solution for analytics in every performance parameter, and today we can also say it comes with the very best value proposition,” said John Dinning, Executive Vice President and Chief Business Officer, Teradata. “Not only is the database license portable across the hybrid cloud options, but so are workloads, enabled by a common code base in all deployments. This flexibility is a first in our industry and means that data models, applications, and development efforts can be migrated or transferred unchanged across any ecosystem. Teradata IntelliCloud™ is the next-generation secure managed cloud offering that provides data and analytic software as a service. 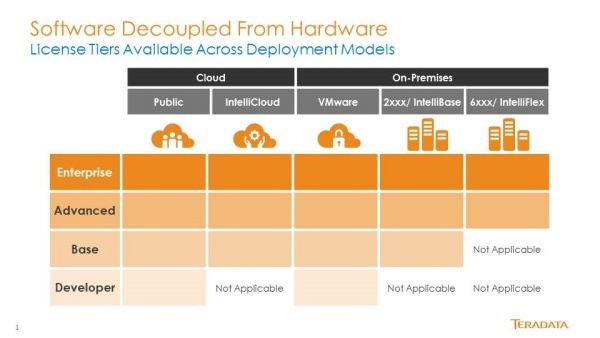 It is available with new deployment choices including Teradata IntelliFlex™, the company’s flagship enterprise data warehouse platform that Teradata will deploy and manage in its own data centers, and global public cloud infrastructure from Amazon Web Services (AWS) and later, from Microsoft Azure. In order to provide simplicity and portability across deployment options, Teradata licensing is based on a consistent metric. This metric is unique in that it takes into consideration not only the number of CPU cores available, but also how much data is fed to the CPU. This benefits customers by adjusting the licensing cost according to the performance potential of the system on which they are running. By using the metric calculation, Teradata can offer equivalent license portability across on-premises, public, private, and Teradata IntelliCloud configurations. Subscription-based licenses deliver on customer requests for lower up-front costs as well as smooth and consistent OPEX spending, making it easier for customers to budget and predict spending patterns. These new subscription-based licenses come in four simplified tiers designed to meet customer requirements ranging from a free tier for database development to high-concurrency mixed-workload analytical systems, with new bundled features. Developer — This free tier is designed specifically for customers that are developing new applications in a non-production environment. The Developer tier is available in software-only versions on public cloud or as VMware to run on non-Teradata hardware. Base — This plan is designed for low concurrency, entry-level data warehouses. It is available in the cloud and on-premises. Advanced — The Advanced tier supports high-concurrency, mixed-workload production environments. It includes powerful Teradata Integrated Workload Management and Teradata Intelligent Memory features. This option is available in the cloud and on-premises. Enterprise — This top-tier plan includes a more robust set of workload management features with Teradata Active System Management and Teradata Intelligent Memory. The Enterprise tier is available in the cloud and on-premises. All the tiers come with the same version of Teradata database software. This enables the easy movement of workloads across tiers. All tiers also come with high-value database features bundled into the license to make it easy for customers to incorporate cutting-edge technologies and build sophisticated analytical environments. These features support Columnar, Temporal, Secure Zones, and Row-Level Security capabilities. Customers can leverage these features for improved performance, enhanced time-based analytics, more robust security and auditability at no additional cost. Teradata’s new license model is available now. 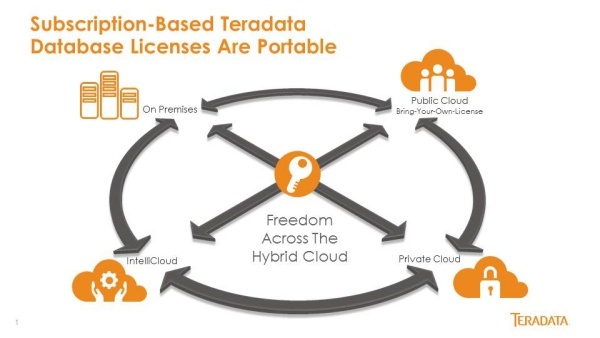 Details on Teradata license flexibility across hybrid cloud deployments, enabled through a consistent and simplified licensing model: click here.